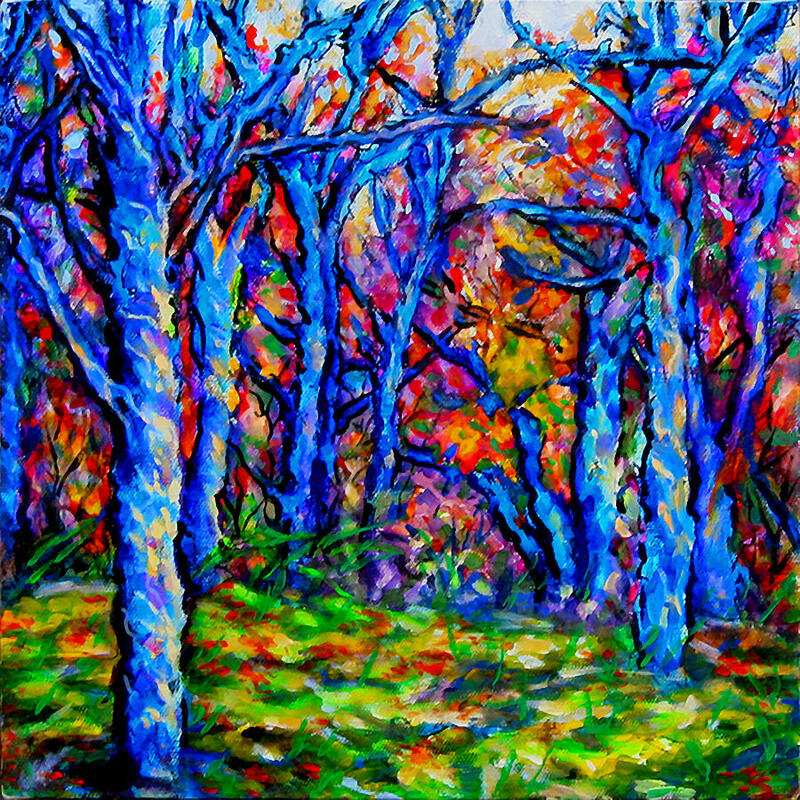 Magical Woodlands 1 is a painting by Laura Heggestad which was uploaded on January 15th, 2010. Well, I had a 'field day' with simply joyous color! While I have used a rather strange color to paint the trees, at that time of day, in that setting, I actually did see BLUE on the tree bark! Seriously. I have to admit that I seem to see 'blue' quite readily on surfaces where some people do not (discovered when they comment, "Where did you get the idea for blue?") Certainly I've exaggerated the degree of blue that I see in the shadows on the trees, but from my perspective it isn't pure fiction, either! I've used a moderate to thick impasto in this painting. As noted in my profile, I can paint similar, original reproductions of this or any of my artworks shown on this site. "Love the way you work with color clarity composition...magnificent...Laura"
I absolutely love this painting. The colors are incredibly vibrant. The painting is full of life. Wonderful job. Great colors ... really nice! There is something magical about being deep in a forest, something almost bewitching. You have really captured that feeling here within this stunning piece. The textures and vibrant colours pull the observer into the scene, and the blues and shadows provide a true sense of depth and texture. Autumn/fall is my favourite time of the year, as I love seeing the colours of the leaves as they turn from greens to deep reds and oranges. Laura, thank you for sharing this wonderful piece with us. Laura, I feel the same about color and love this. You also have a talent for words too. Outstanding piece of artwork Laura. You have a very interesting way of painting what I feel when I am painting. You paint from the heart not jest the eyes. It's really nice to have you on FAA with us. ..lovely colours..and the texture effect... i like it very much.. Thank you, Elise! You are one of the first people to comment on my artwork since I entered it on this wonderful website yesterday. I gather from your photo that you are an artist! I'll look on this site for your artwork. Thank you again for the warm welcome! Hi Laura, beautiful colorful palette!! !